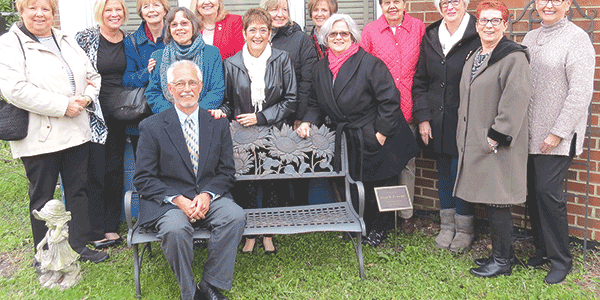 Harold Crowder sits on a bench dedicated to the memory of his wife, Mary. Also pictured are former teachers. From the day the doors of Ecoff Elementary School opened in 1990 until her retirement in 2011, Mary D. Crowder was a beloved primary teacher at the school. When she died in August, a group of her former colleagues decided to place a lasting memorial to her at the school she loved. A bench with a sunflower design was recently purchased and placed in the school garden outside of the library. 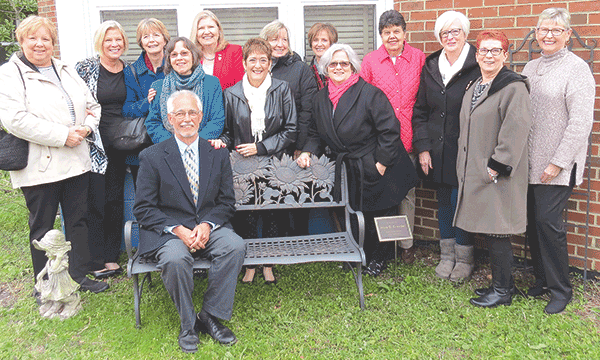 Crowder’s family and her coworkers held a ceremony when the bench was unveiled. The school’s first principal, Mary Dunn, spoke, as did two former teachers, Marianne Lyon and Jeanne Hensel, and Crowder’s husband, Harold. Current Ecoff teacher Cheryl Dunford accepted the bench on behalf of the school.